I glanced at the pile of books on the end table. They weren’t doing anything other than being books but they were askew. I contemplated my next move. I wanted to straighten them so bad. My hand inched in their direction. Then the coasters started in. They weren’t sitting right next to each other. One was on one side of the end table and the other was diagonal to it. The coasters should either be stacked or lined up even with each other. “Come on, just straighten the books and the coasters, it’ll make you feel better. You’ll sleep better. You’ll be in a good mood in the morning when you come downstairs and all is as it should be,” my brain said. “This is your fault,” I told my brain. 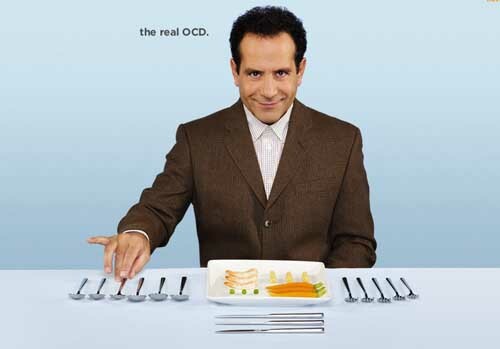 “You are turning me into an OCD person. Is that what you want?” I said, straightening the books and the coasters. “There is nothing wrong with being neat,” my brain said. “This isn’t about being neat—this is an ever increasing obsessive behavior hence the Obsessive in the acronym OCD. I was putting the throw pillows on the couch in order of height and slanted at a 45 degree angle. I stepped back to check my work. Perfect. “Are you coming to bed?” Layce called out from the bedroom. “Yes, I’ll be right there,” I told her. I’d moved onto the kitchen. I couldn’t possibly leave those dishes in the drying rack. “See, now I can’t go to bed without tidying up the already clean kitchen.” I put the dishes away and got the dish cloth out and wiped the counters down again. “We’re moving into the Compulsive part of OCD. I can’t go to bed without doing this or I’ll lay awake berating myself for not doing it,” I told my brain. “Who are you talking to?” Layce called down. “My brain. It’s acting up again,” I said. “I do not have OCD,” I lied. Then to prove my brain wrong I walked over to the books and messed them up. I flicked one of the coasters so it was uneven. “Hah, take that,” I told my brain. I climbed into bed and kissed Layce good night. I laid there. For exactly three minutes. I sat up. “I’ll be right back,” I told her. To straighten or not to straighten, that is the question, and I know the answer.